These features provide some of the great functionality you can find in Fiery® JobMaster™. For more information visit the Resources page. 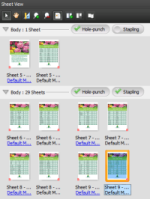 Also, visit the Print Applications pages for more information on how to produce high-margin print products such as brochures, manuals, books, reports, tab-separated documents and more with Fiery JobMaster.